For those of you that you know me, you know that I am a horror movie skeptic. I get fed up with the endless slasher films and b-rated crap out there, so I usually only watch a horror movie if I think that it has potential. With that said, I showed up to watch The Conjuring on opening night in theatres. The film is supposedly based on a true story. It follows Ed and Lorraine Warren who are known as demonologists, or paranormal investigators. The couple is called upon for help from a family who are experiencing horrific unexplained events in their new house. The movie tells the story of the case that turned out to be the most disturbing during their entire career as investigators. The movie was directed by James Wan and the noteworthy cast includes Vera Farmiga, Patrick Wilson, Ron Livingston, Lili Taylor, Shanley Caswell, Hayley McFarland, Joey King, Mackenzie Foy, Kyla Deaver, Shannon Kook, and John Brotherton. The Conjuring was spooky. The film does a wonderful job of gradually building the tension until the creepy climax of the story where horror is all over the screen. You’ll be able to feel the tingling down your spine from the chilling images scattered throughout the movie. I think that I expected the film to be scarier. However, it did have a good amount of horror throughout. It was very tastefully made. It definitely didn’t feel like it tried too hard. It turned out to be just the right amount of freaky. Any more might have made it less believable. 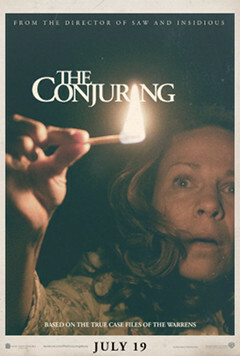 For a horror movie, the acting was pretty decent, especially from Farmiga and Taylor. This was a major contributing factor to the quality of the film because more often than not, scary movies have poor actors. The movie was slow at times, but that didn’t really take away from it. It just took its’ time building the tension. The special effects were spooktastic and very haunting. It’s amazing what they can do these days. 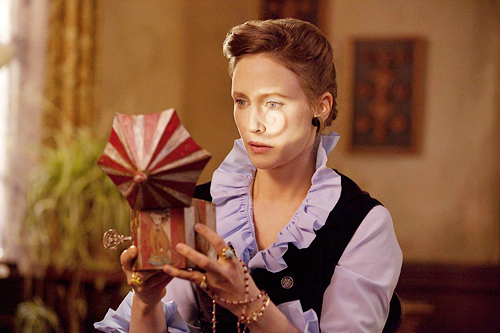 Overall, if you are looking for a good creepshow, then look no further than The Conjuring. It could quite possibly be the best horror movie of the year. Posted on July 21, 2013, in Horror Movie Reviews and tagged Ed and Lorraine Warren, Hayley McFarland, James Wan, Joey King, John Brotherton, Kyla Deaver, Lili Taylor, Mackenzie Foy, movie, Patrick Wilson, Ron Livingston, Shanley Caswell, Shannon Kook, The Conjuring (2013), Vera Farmiga. Bookmark the permalink. 7 Comments. I wouldn’t classify myself as a huge horror fan but this film has me interested in checking it out. Glad to read it went for scares rather than simply gross out. Thanks for the comment Sanclementejedi! As far as horror movies go, it was quite good. Thanks for reading. Great review, this is on my films to see list. Thanks Vinnie! It’s the best horror movie that I have seen in a while and I’m not usually a fan of horror movies.